I took a step off the path of carving. But I always love playing with wood. And now I can literally PLAY it! 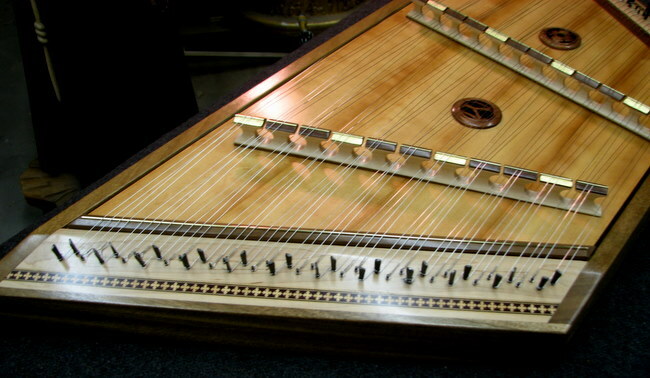 My wife and I over the summer attended an event where someone was playing a Hammered Dulcimer. My wife didn’t know what it was and was intrigued. I knew what it was but I saw Wood. I thought it would be fun to build something like that sometime. Seemed simple enough. Well a couple of weeks ago I got the bright idea to try and build one for my wife for Christmas. Now it’s easy enough to buy a kit as there are kits for pretty much anything. And it’s easy to buy all the parts to build instruments as well. Same for strings, hammers ( for the instrument) tuning tools, rosettes, tuning pegs, hitch pins rosettes etc.Do you think I can do that? Nope! I had the idea to make everything short of making the wire for the strings. So I forged my own tuning pegs and made jigs to locate the hole precisely on each one as well as have the lengths exactly the same. Same for the hitch pins, more jigs so the small groove that catches the loop in the string is exactly the same . I needed 46 of each. Several days later they were done. Go figure,, for $6.99 you can get a pack of 25 ready to go. 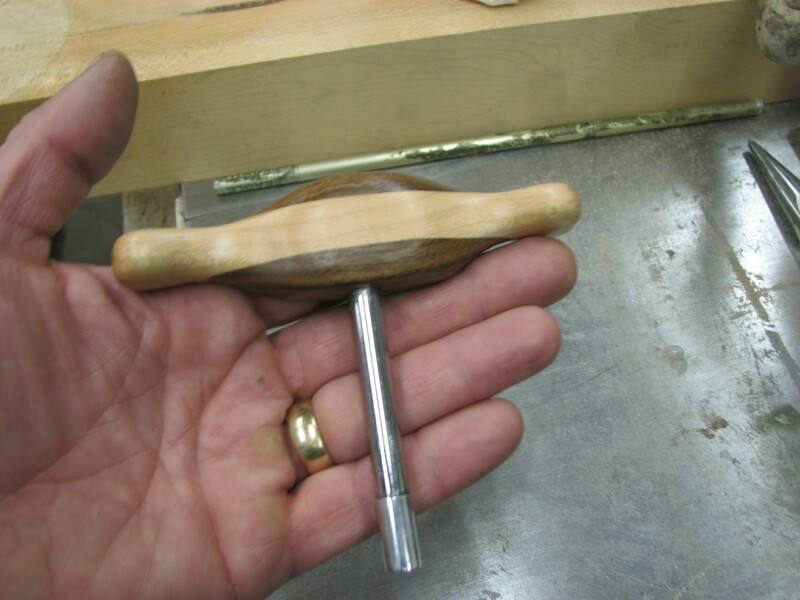 Since I made the tuning pegs I had to make a tuning tool as well. I used a carriage bolt , sliced a slot in the end and then turned it down a bit on my bench grinder to accept a section of aluminum arrow shaft to act as a collar to slip over the pin. Being around wood I had always heard that Spruce was a good wood for instruments. So I got some great pieces , 4 inches wide and was able to joint them and glue up a top. The wood ended up at 1/8th inch thick. That was fun. It was only a 32nd thicker when I started, and I don’t have a thickness sander. The rest of the frame is African Walnut. It has an amazing grain that photos just don’t do justice. The tuning section is Maple with an inlay I’ve had sitting around the shop for 20+ yrs waiting for a place to go. The back is Birch. The rosettes, 2 inch diameter were turned out of Cherry, 1/4 inch thick with the center relieved even more. The one design is from the inlay, and the other is my initials overlaying each other. The ‘M’ and the ‘Y’ do this nicely and it’s a neat way of signing the piece. I made a jig out of an old low rpm motor to help me make the tiny loops in the strings. That .20 piano wire is a bugger to work with. Without my tool it would have been a mess. I ended up with nice tight,, actually stylish ,,, loops. For the bridges I decided to segment them and have inlaid brass rod for the strings to lay on. The same for the side frets. 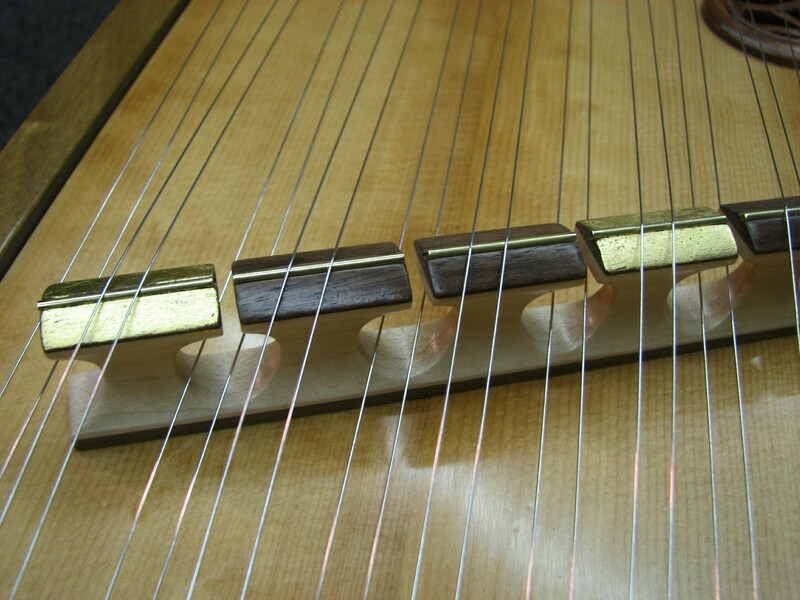 Speaking of side frets, the long strip that the strings initially cross over right at the sides, serves a dual purpose. I decided to have the top completely free floating. This means it’s not attached anywhere. 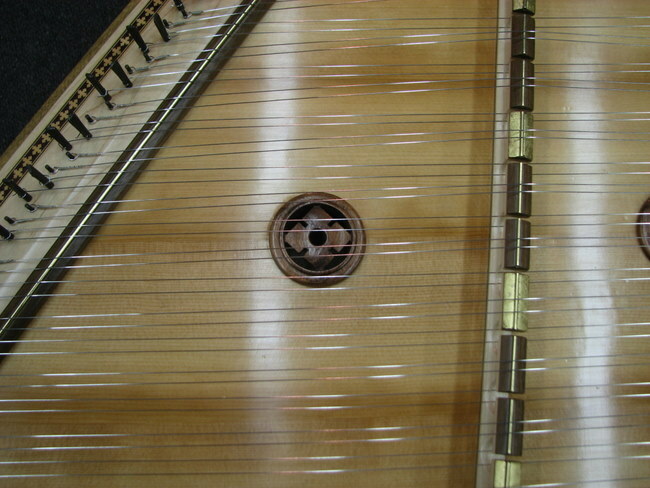 Under the top, and directly under the side frets is a small ledge that the top ( the sound board) sits on. The top and bottom of the soundboard aren’t touching anything as there is an 1/8 th inch gap here. The only other support is narrow strips directly under the bridges. So the top is just sandwiched between the bridges and the frets and the small supports underneath them. The rest of the box is just empty space to produce sound volume. Many , if not most just glue the entire top to the frame and leave sound holes. Well , I may try that at some point, but I wanted to see how this works even though it’s a lot more trouble and greater need for accuracy. That very thin top can’t take much pressure without proper placement of the bridges, and the tension of the strings is the only thing keeping the bridges, the frets, the top and the supports underneath them in place. Nothing is glued into position. If I remove the strings,, the entire piece comes apart and I’m left with just a frame. 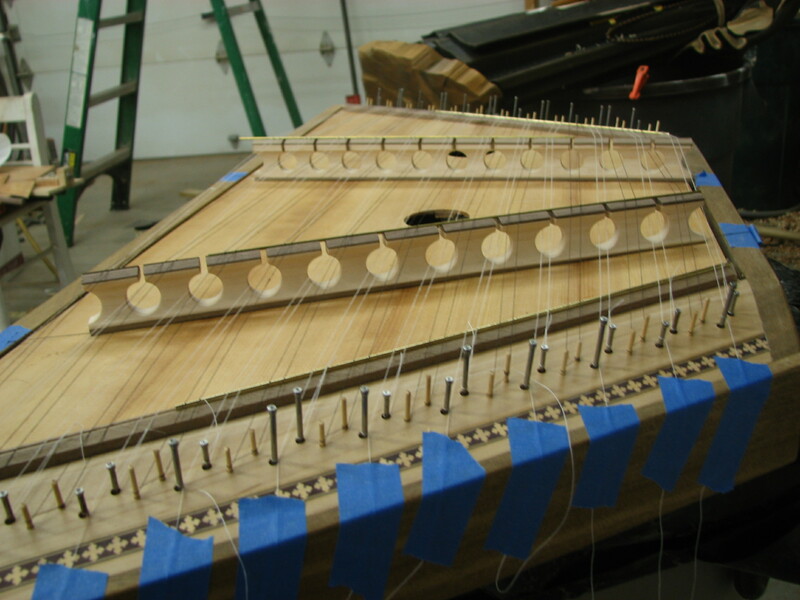 The two bridges were segmented as it’s easier to string the instrument and it isolates each string. These , as well as the side frets have inlaid brass for the strings to lay over. The bridges were marked with 24K gold to indicate each major key. I made the hammers ( the pieces for striking the strings) double sided. One side is bare wood and the other is lined with suede. It produces two distinct sounds. For finishing I went old school and pre VOC rules and used Nitro Cellulose Lacquer. Multiple coats and then hand rubbed. I read somewhere that this too was a great finish for instruments. Hey , what do I know about these things. Speaking of which the total info I had when I started making this piece was essentially, the side angles are 55 degrees. The length of the strings breaks down into multiples of 5 so you can use 2/5ths and 1/5th for the placement of the bridges.And there are 12 treble and 11 bass strings. Really , it wasn’t much more than that. I used this info to draw a full size plan, and a side view and off I went. I just finished stringing it today, well, last night actually but had some adjustments to make today and got it tuned. I learned that it can take up to 6 months for the instrument to “find it’s voice” . Meaning the wood takes a set, the finish hardens completely etc. to stabilize. 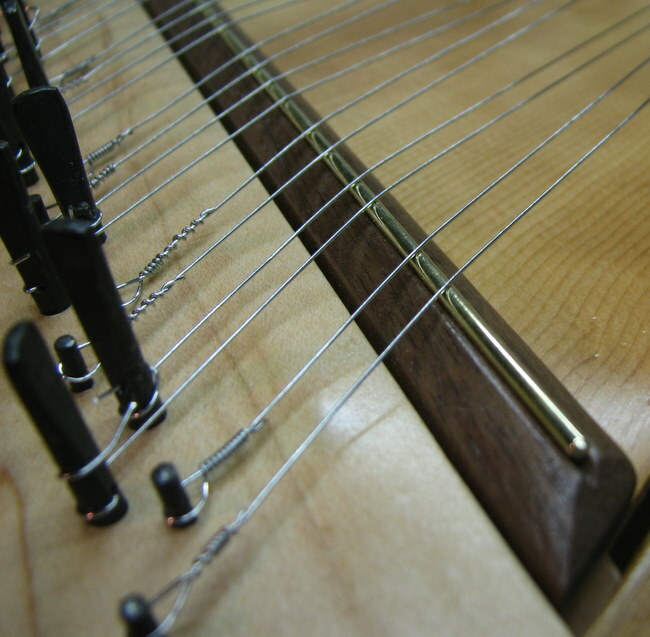 And it can take several days or more for the strings to stop stretching and hold a tune for a reasonable time. Whatever it’s voice will be 6 months from now will have to be something really special because right now, this thing sounds amazing. The resonance , sustain and volume it can produce just shocked me. And the difference between the wood vs. the leather striking the strings is like night and day. One is similar to a Harpsichord, and the other reminds me very much of a steel drum in some respects. Either way there is still that Medieval quality to it. I hope my wife likes it as much as I do. Now , my mind is spinning with a larger one, with greater range, and you just have to know that all those side pieces are just begging to be carved! That one will be mine! Believe it or not, I started by making the tuning tool and hitch pins first. Not the box itself. Why? I don’t have a clue. Here is the tuning tool which I made out of a carriage bold, polished it, cut the top into a square to be fitted into the 3 piece handle and the other end I slotted to fit over the tuning pegs. The collar is part of an arrow that serves to locate the tool over the pins and keeps it from slipping off as you use it. Seemed to make sense to me at the time. 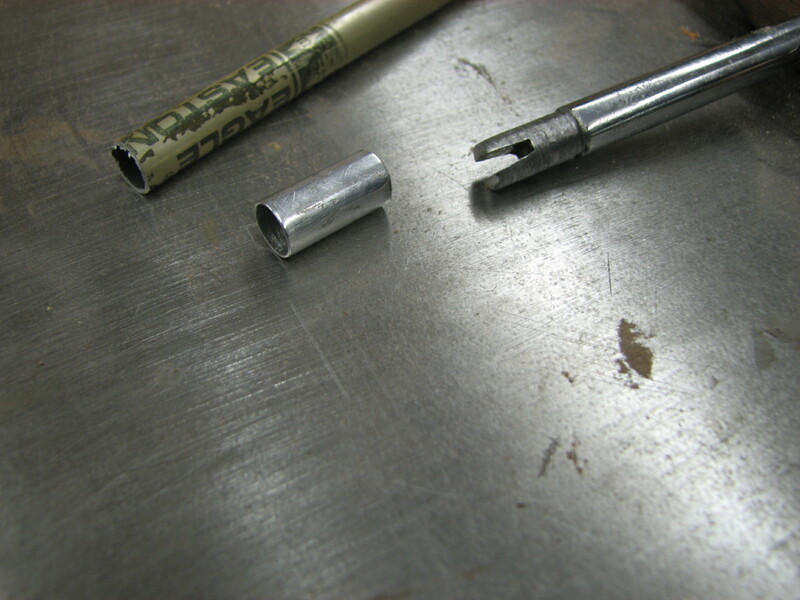 A factory sample on the left of a tuning pin. The samples I started with to see if I could duplicate it. Well it worked, after making a few jigs to keep everything exactly the same, hole location, length, depth, height above the hole etc. 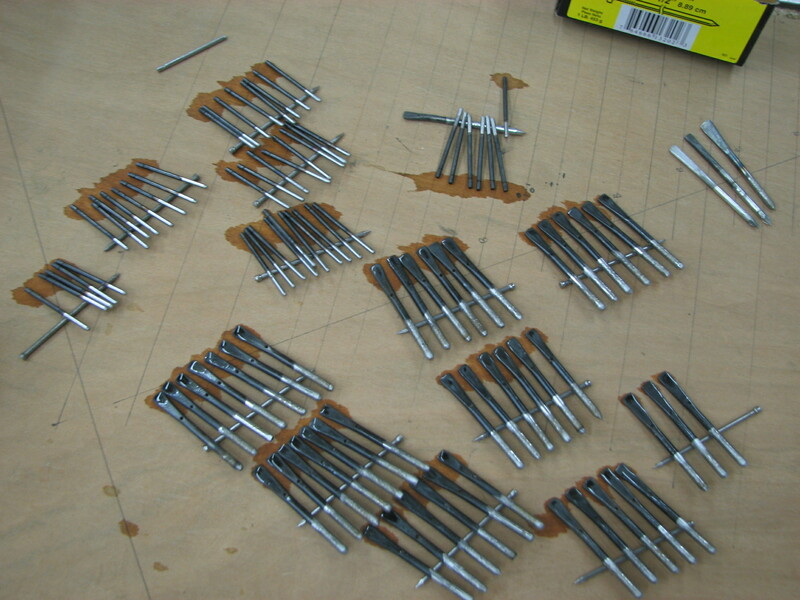 here are the tuning pins. 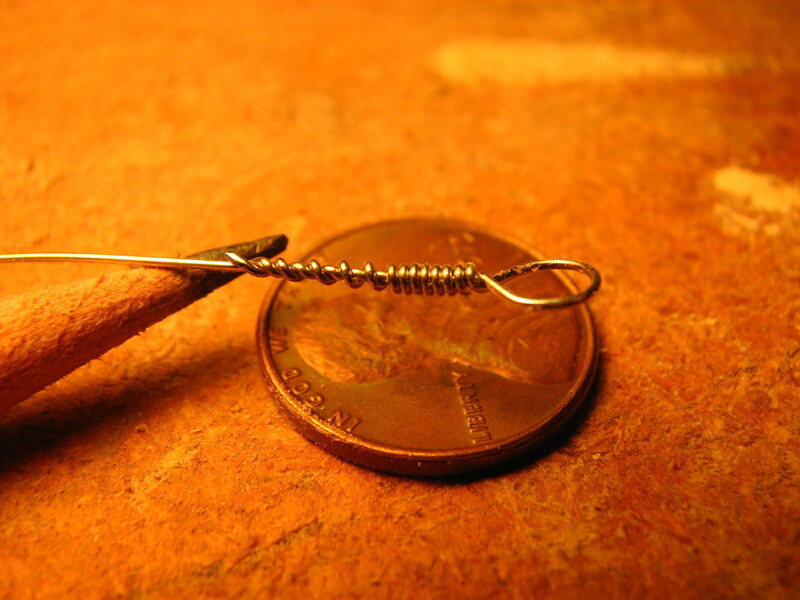 The hitch pins as well needed a couple of jigs in order to have a small groove at an exact location to catch and hold the little loop on the strings. 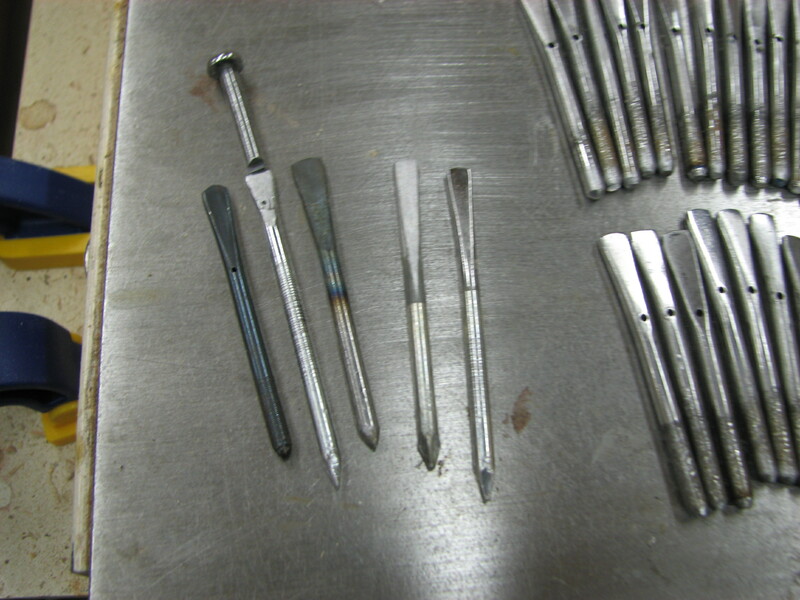 This photo is just after I dipped them into a solution of acids that blackens the steel by oxidizing them. Amazing stuff, just the opposite of Tarn-X . Works instantly! Believe me, buying these things at the rate of 25 for $6.99 would have been the way to go. But I wanted to make it all myself. Here is the basic box. See, pretty simple as far as construction goes. I cut the maple blocks at 22 degrees so the strings pull tight over the edge before hitting the side frets and the main bridges. As a note, the Bass strings fasten to the left side go over the Bass bridge and under the Treble bridge. The Treble strings do just the opposite. 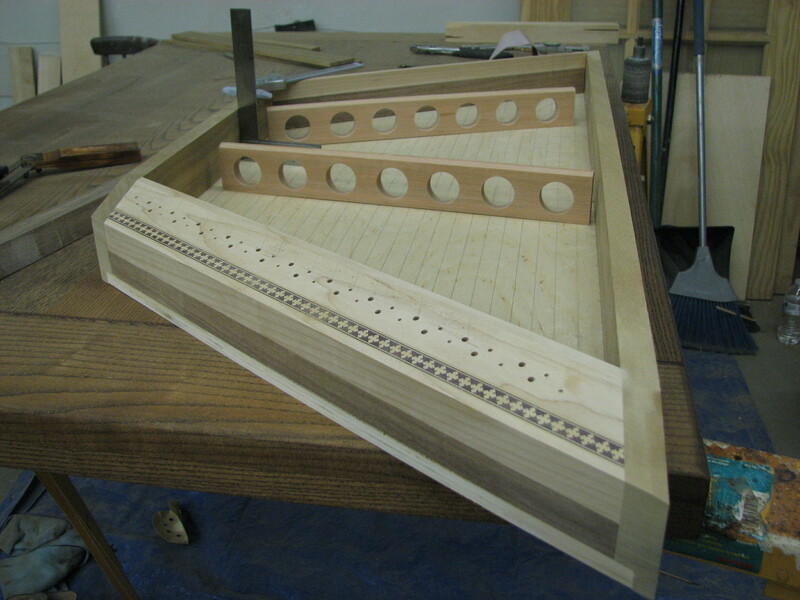 That’s why there are large and small holes in the Maple for the tuning pins and the hitch pins. I also laid out the holes so the strings ( 2 strings per note, not one like a guitar) were 1/4 inch apart, and 1 1/4 distance between the center of the strings. 12 ( 24 total) strings for the treble, and 11(22total) for the Bass. Also in this shot, you can see how I built up the blocks with Maple for the pins, and walnut underneath. All this got covered with the side frame of African Walnut. Here I’m making essentially a test run. 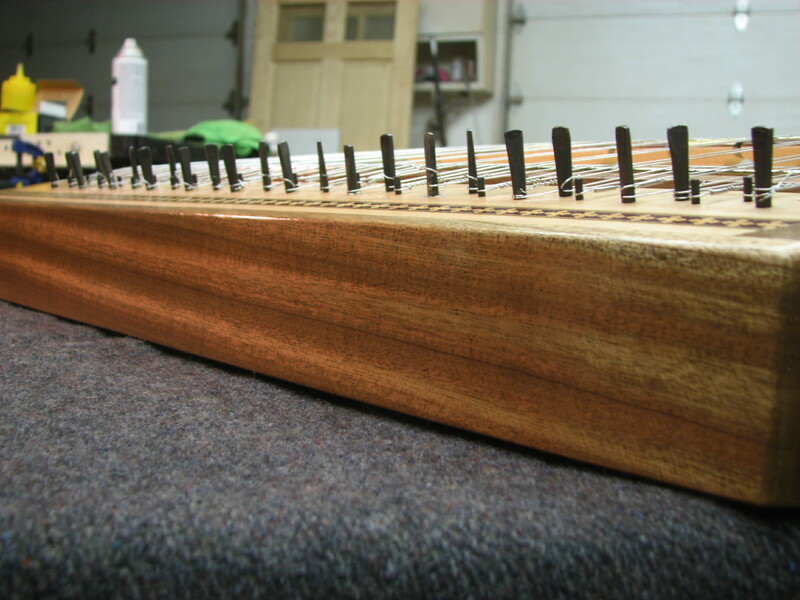 I got black and white sewing thread and strung the instrument. Hey, I have all these pieces made and I don’t know if everything will actually line up. I’d rather do this than play with that stubborn piano wire and make sure it’ll all line up. A few tweeks here and there and I was ready to start applying the finish. Nothing worse that finishing all the parts and THEN find out something isn’t quite right and needs to be changed. This solved ( most of) that phenomenon. And of course the strings. This wire wants to do nothing but stay straight. It may look thin but it has no intention of bending. This is NOT like playing with cold rolled wire. This likes to pretend it’s a steel bar and not bend. Getting it to wrap around itself like this is not an easy trick. Without the tool I made these windings would look like a birds nest. Believe me. Get a piece of this wire and try it for yourself. The other thing this wire likes to do is to turn you into a human pin cushion! Speaking of pins,, this stuff is very similar to a pin. A short section of this could easily double as one. Now, imagine wrapping a pin around itself like this and you get the idea. Well after all that, and multiple coats of lacquer here it is. 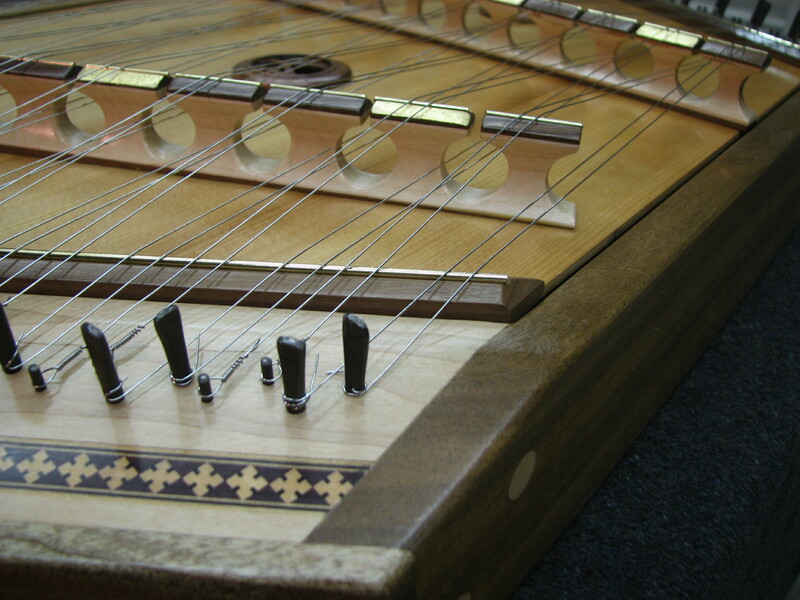 The pin blocks, hitch pins, tuning pins and the decorative inlay. Had to do something to dress it up a bit since I didn’t carve on it. This is the pin block on the right of the instrument. You can see the slight gap I held along the base here where the soundboard comes close to the bottom rail. I did the same thing on the top rail with this slight air gap for sound. 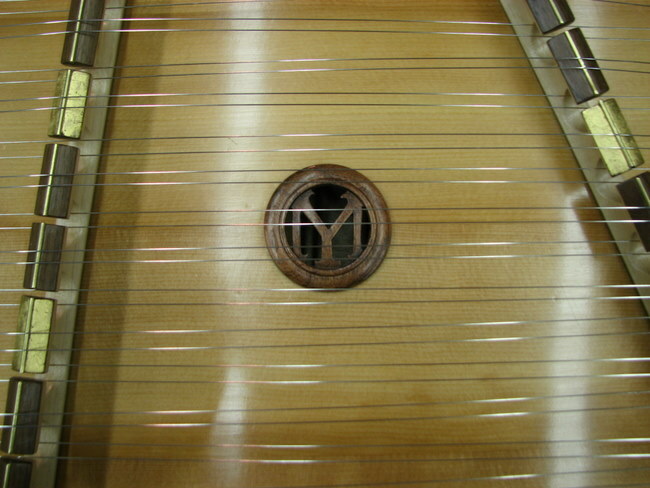 The fret directly under the strings shows the inlaid brass rod for the strings to lay on. 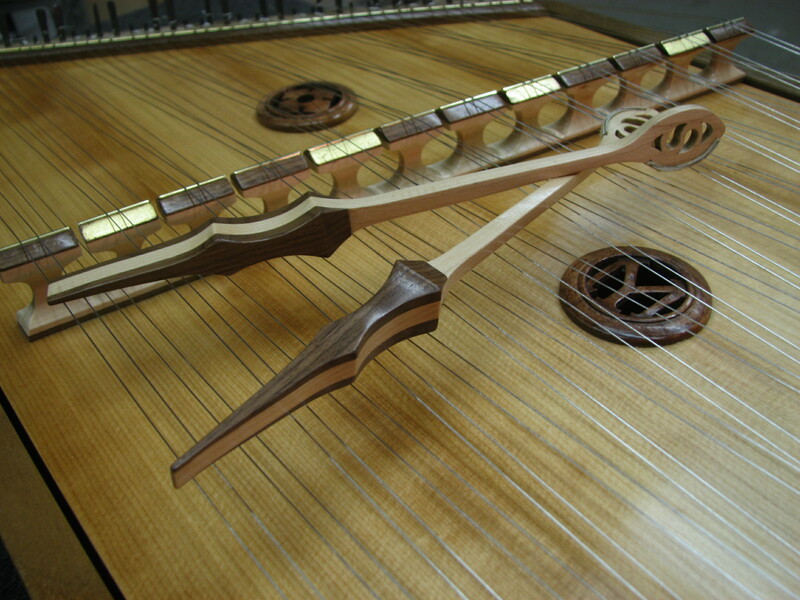 The bridges also have segmented brass rod for the strings to lay on as well. 2 inch Cherry rosette with my initials. The other rosette with the design element from the inlay. You can also see in this shot the segmented bridges to isolate each string as well as the 24K gold I used to indicate the major keys. The hammers, about 9 inches long and symmetrical so they can be used either with the wood side striking the strings or the leather side. The balance is so nice on these as well as easy to use as they are cradled between your thumb and index finger and with that balance you just sort of flick them with the rest of your fingers to strike the strings. Doesn’t take much. And just more photos from here on,, just because I think it’s neat to look at. That wood is flat as can be! The grain makes it look like it’s grooved. And as you turn it, these grooves flash a bright gold leaf look to them. The photo doesn’t do it justice. Well there you have it. Or actually my wife will have it. I hope she likes it. If she doesn’t , she can always re-gift it to me. Naw,, I got plans now that I have this one under my belt , and all the bugs worked out, that I’m building another . Hope you enjoyed my new journey into another facet of this world of wood and woodworking. 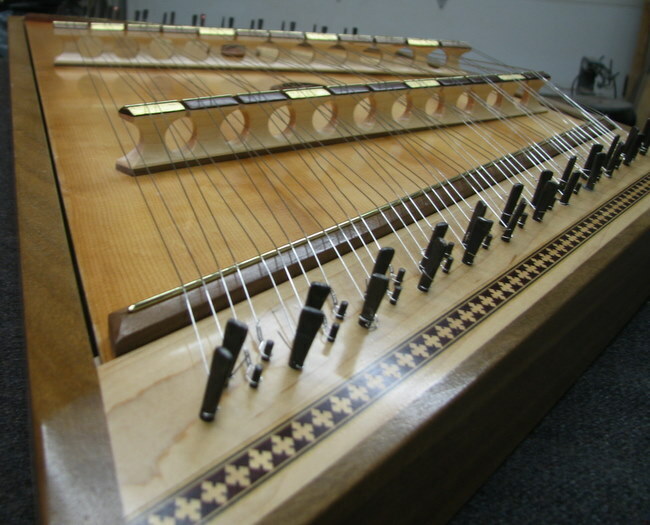 Having spent some time in West Virginia, I can say that that is without a doubt one of the most unique dulcimers I’ve seen. You’ve done an excellent job on it. A lot of folks make these and are available through artisan guilds around WV and Virginia, but I don’t think they have the overall ‘oneness’ that this instrument presents. 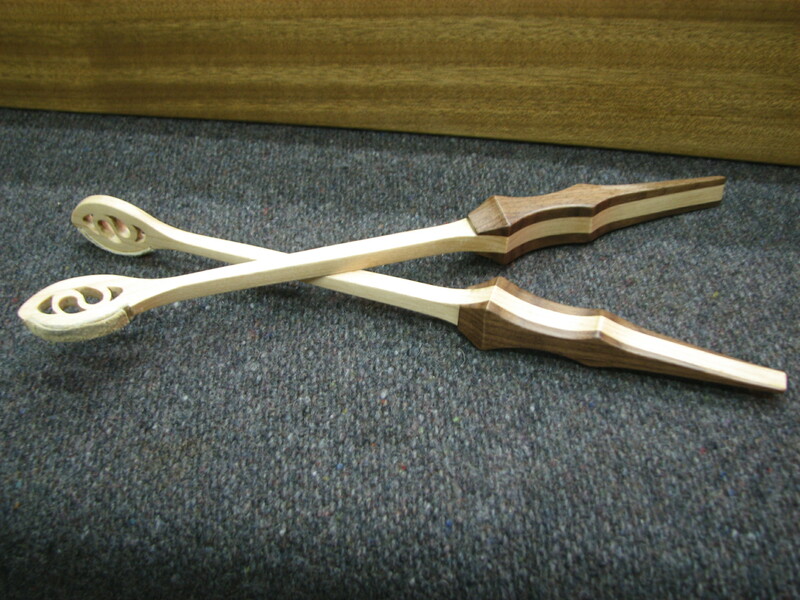 All the inlays look great – did you scroll saw the rosettes and mallets or did you carve through? They add much to the overall appearance of the instrument. Ok, so now that you are a carver, wood worker, machinist, blacksmith, luthier and manufacturing engineer, what else are you going to tackle? Quite amazing! Thanks for the generous comments. There are , from what I’ve seen , many ways to build one of these. 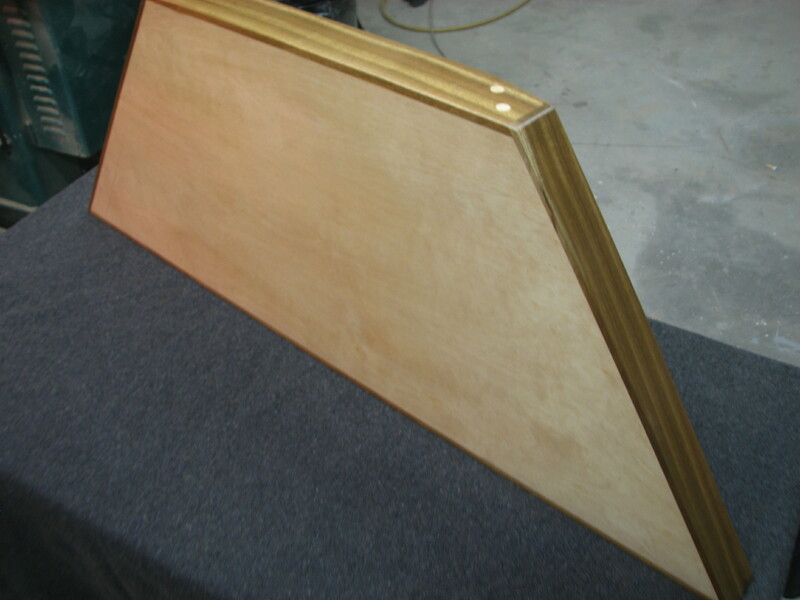 The simplest and fastest way is to simply make a frame and skin it front and back and glue it on. In an afternoon you could almost call it done. I had only read about , but haven’t seen one with the full floating soundboard such as mine. So off I went and solved the problems as I went along. It may look intimidating at some level, but it really is fairly straight forward. My wife ( nor I ) probably won’t go in the bluegrass direction. We love classical music and this will lend itself to that as well as Medieval or Renaissance style music. Oh, I’ve since read up on Chromatics, the full range of a Violin ( also on my list to make) as well as a simply larger instrument with more strings. Now that I know what to watch for I’ve solved many of the glitches and I’m ready to go. This one is straight forward as the next will be carved every which way. And I’m planning a Honduras Mahogany top. The hammers and rosettes. I scroll sawed the Yin -Yang ( looks like a simple “S” doesn’t it?) in the hammers as well as the rosettes. I chose this design because I wanted to lighten the hammers in some way and this is neat as it’s symmetrical as the hammers are used either way, the natural wood vs. leather, me giving it to my wife, male/female, wood/music etc. Seemed appropriate. The rosettes I chucked in my lathe, spun them to 1/4 inch, 1/8 in the soundboard, 1/8 above the deck. Scroll sawed them after relieving the back to leave a thin surface to cut through. What else can or will I do? I like to think I’ll try most anything. Besides being able to rebuild engines and most anything on a car as well as a few restorations under my belt ( the nicest was a 57 chevy pickup) the list includes, welding, painting ( 8 cars), concrete, general construction ( additions) all facets of home wiring up to 220 volts, all facets of plumbing ( from furnace installation to main sewer lines which I just did at one of my homes, hand made knives with acid engraving, tempered and annealed, custom gun work ( used to be a speed shooter as well as bullseye) , hand made soap from lye in a variety that sound like something you would eat instead of bathe with, that’s a fascinating process silly as it may seem, custom made shaving brushes ( nice sideline) with my own resin poured and turned handles with natural Badger hair and ,, well,, the list just goes on and on. Like I said, I’ll try anything and have a ball doing it. It’s the curse of a curious mind. Everything sounds like fun to me. Used to drive my wife nuts always going off in different directions,, but now she just says ” OK,,” And ,, she’s learned , but I’m wise to it now, to get me to do something all she has to say is,,, ” I don’t know if you can do this,,,but I saw a______” And off I go. Whatever it is,, I’ll figure it out. And in many cases,, I don’t want to own the final product,, I just want to build it. That’s the fun part. After that,, I get bored. Bob,, sorry I missed your post. I apologize. Ha,,, STRIKINGLY beautiful. Not many people do,, but I love puns! I’m always playing with words. Upload a recording. Of what,, me trying to play “Mary had a little Lamb?” Not yet my friend. Soon I hope. It’s getting better each day as I “fiddle” with it. Tonight I got the makings of Edelweiss. I do think my time will be up once I give it to my wife. Yup, time to make another. wow mark, that is simply beautiful. what a great gift. it is a pleasure for the eye, and i hope too we may hear it if possible. and your writing is so exciting, i feeled like standing beside you and watching… loved your description of the wire,,, i played with wire some time too, and know what you mean,,, hehe i am laughing, even though i knew you build a hammered dulcimer, i am speechless looking the pictures and reading the story. the instrument is not only beautiful, it shows the fun you had figuring out all the jigs, and procedures, to get everything accurate. i am sure it sounds as wonderful as it looks. thank you so much for sharing.